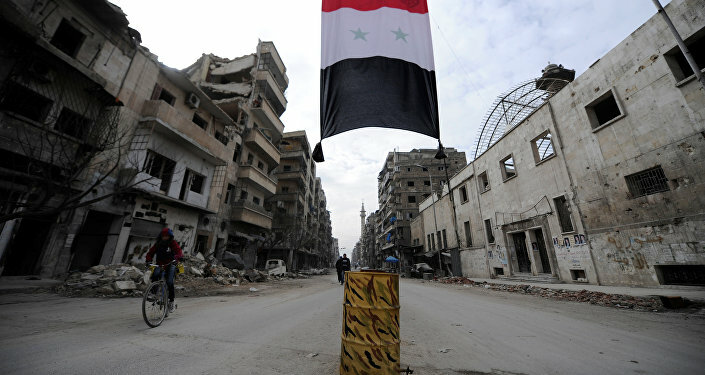 MOSCOW (Sputnik) — The next round of the UN-mediated intra-Syrian talks is expected to start on February 23 in Geneva. "This time it is true that Mr. de Mistura makes something that does not have relation to the UNSC Resolution 2254. Until now we have not received any invitation as Hmeymim group. We will need to talk about it after this [round] finishes," Krydee, who is also the Syrian Democratic Front's spokeswoman, said. Earlier in the day, the leader of the Cairo group of the Syrian opposition, Jihad Makdissi, told Sputnik that his platform had been invited to the talks. Before that, the HNC was the only group that could confirm the participation in the upcoming round. The Moscow platform of opposition, headed by the leader of Popular Front for Change and Liberation, Qadri Jamil, declared on Saturday it would not participate in the upcoming talks due to "special advantages" that the United Nations gives to the HNC, and the alleged disregard to other opposition platforms. The Moscow platform also blamed UN Special Envoy for Syria Staffan de Mistura for violating the UNSC Resolution 2254 and "obstructing the historical chance" of the talks. The United Nations did not comment on the decision of Moscow platform, but said the consultations on the final list of participants are still ongoing. On February 12, the HNC announced the final composition of the delegation to participate in the upcoming settlement talks. The list comprised 21 names, including 11 opposition politicians and 10 representatives of armed groups. Russian Foreign Minister Sergei Lavrov stressed earlier on Monday that intra-Syrian talks in Geneva cannot be held without the participation of government and the entire spectrum of the opposition, as set out in the UN Security Council resolution 2254, and called on the United Nations to remedy the situation.